In short, yes you can trademark a hashtag. Social media has become a major marketing tool for those who wish to brand their product or service. Hashtags have allowed users to focus their content around a statement to attract attention and to even control the conversation. The first step is to determine what is registrable as a trademark. A trademark is a sign that is capable of distinguishing the goods and services of one company from those of another. In sum, it allows consumers to identify the source of a product or service. 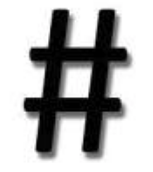 While a #hashtag alone is a generic symbol with no source-identifying significance, used in conjunction with a product name or campaign tagline it may function in the same way as a trademark and be registrable as such. So in summary, just simply having a catchy hashtag on your news feed is not enough, it must be associated with a product or service.